I made my first Shutterfly photobook in 2009, and I've been a big fan ever since. Their software makes it so easy to add photos, and you can customize layouts, text and icons to your heart's content. For the sports fan: Make a "been there, done that" book with photos of all the big games he has attended, or a photo of each football/soccer/basketball/hockey/(whatever his favorite sports is) stadium. Make sure you include the date, place and teams playing. For the cook: Make a recipe book of her (or your) favorite dishes, with the recipe on one page and a photo of the finished dish (or of her enjoying it!) on the opposite page. This also works for alcoholic drinks! For the new parent: Make a toddler activity book featuring all the fun crafts and activities your children enjoyed at that age (if you don't have kids, there's always Pinterest! ), with instructions and photos of the finished craft. For the traveler: Make a "my favorite places" book with scenic photos of all the landmarks she's been to, or all of her favorite places. Include interesting facts about the places. In order to make the photobook really special, you'll probably need to enlist the help of a spouse/parent/sibling/son/daughter or someone who has access to their photos. With a little bit of preparation, you'll be well on your way to creating the perfect photobook present for the people you love! Win a Shutterfly photo book! TWO lucky Bonggamom Finds reader will receive a code good for a free hardcover, 8x8, 20-page Shutterfly photo book (shiping and taxes not included). View the Shutterfly Photo Books: Best Gift Ever video, then leave a comment on this post telling me which scene in the video reminds you of a special moment in your own life. 3) Pin this giveaway on your Pinterest board (1 entry -- you can use the "Pin It" button at the bottom of this page!). 4) Check out Shutterfly's photobook styles, then leave a comment on this post telling me which style is your favorite. I entered the Shutterfly Photo Book giveaway! This giveaway ends at 11:59PM PST on Dec 10, 2012; I will draw a winner at random on Dec 11 and post their name after they confirm acceptance. Continental US residents only. For additional giveaway rules, click here. Disclosure: I received a free Shutterfly photobook in exchange for this post. Prize codes are also provided by Shutterfly. Prize codes do not include shipping and taxes and expire on December 31, 2012. The views and opinions expressed here are my own. Welcome to Bonggamom's Friday Finds! If you've found your way to this page, I'm guessing you love giveaways as much as I do. Whether entering or hosting a giveaway, there's something for you here! You can leave a link to your own giveaway, or check out all the giveaways listed here and enter the ones that catch your eye. During the holiday season, when everyone seems to be spending with abandon, it can be challenging for parents to teach kids about responsible financial behavior, especially when the urge to spend -- on presents, decor, lavish parties, rich food -- is so tempting for us as well. You want to buy everything for your child, but you don't want to give in to (or show your child that you condone) unrestrained spending or being overly materialistic. You want to teach your child financial responsibility but you're reluctant to give them too much financial freedom. 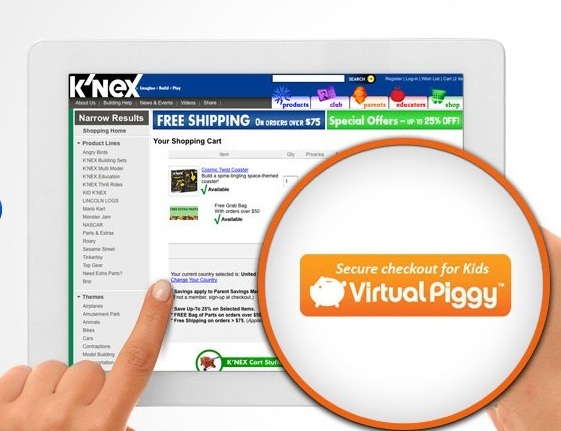 Enter Virtual Piggy, a new service that can help parents give kids a safe, easy way to save, spend and give online. It's perfect for today's ecommerce world; parents do so much of their shopping and spending online, so why should kids be any different? And why shouldn't their allowances be managed online as well? With Virtual Piggy, parents can create a parent account and set up preferred shipping and payment methods (credit cards or even PayPal). Kids don't have access to any payment information, and nothing is charged or deducted unless your child actually makes a purchase. After parents create a parent account, they establish accounts for each child. They can specify controls for each child's account: allowance amounts, spending limits, monthly saving accounts, approved merchants, parental notifications. You control how much money your child can spend, when and where he spends it. Kids can use the balance in their Virtual Piggy accounts to shop at online sites with a special Virtual Piggy payment button. Over 80 online sites have signed up, and Virtual Piggy is working hard to get the Virtual Piggy payment button up and running on all of them (head to Virtual Piggy's website to see their list of merchants). Current sites that support the Virtual Piggy payment button are K'nex, O'Neill, Super Sprowts, MusicSkins and Blee Inara. Kids can also use the balance in their Virtual Piggy accounts to purchase gift cards to popular retailers or sites, such as Barnes & Noble, Sephora, Zappos, American Eagle Outfitters, even Domino's or Papa John's Pizza. (hey, how else will they be able to treat the gang to lunch?). If the purchase meets parental guidelines, it's approved. What a great way to give kids the freedom to spend money online, within parent-approved limits, while protecting them from unsafe online transactions! 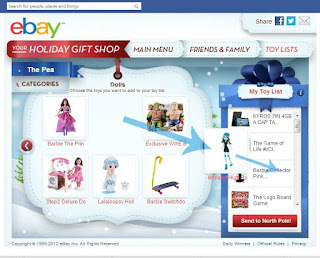 This holiday season, families can also use Virtual Piggy to manage their kids' holiday wishlists. Kids with a Virtual Piggy account can create a Wishlist and add the products they want to either save up for, or receive as gifts. 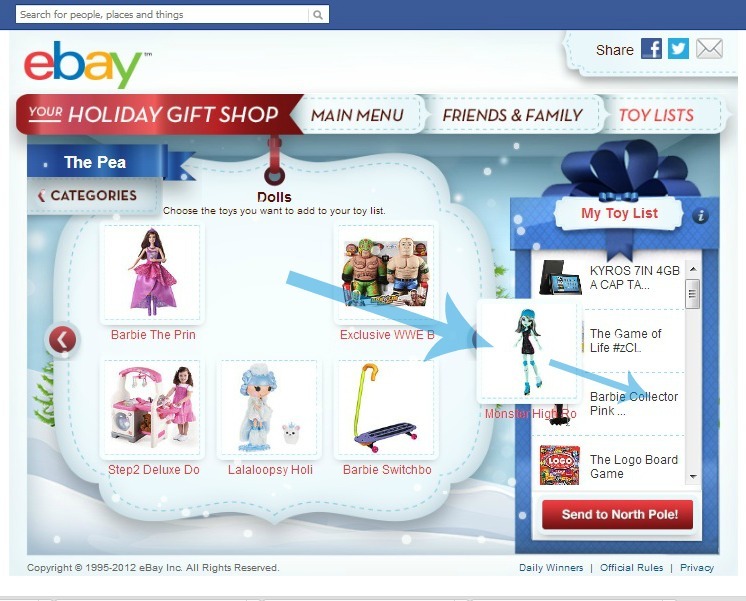 Parents can view their kids' Wishlists and share it with extended family and friends. Virtual Piggy even has discounts with their online partners, exclusively for Virtual Piggy account holders, just for the holidays (All discounts will end by January 15th). You can see the list of merchants and the holiday discounts on the Virtual Piggy Member Value Program page -- but you won't see the promo codes unless you've logged into your Virtual Piggy account! Here's another great reason to create a Wishlist with Virtual Piggy: Virtual Piggy will be selecting ten lucky children to win the contents of their Wishlist, up to a value of $500! Their Win Your Wishlist contest is open till December 7, so hurry up and create that Virtual Piggy account and Wishlist ASAP. Happy holidays, and happy spending and saving! Disclosure: I received compensation from Virtual Piggy (via Splash Creative Media) to try the service and write this post.The views and opinions expressed here are my own. You know how babies and kids sometimes end up loving the big cardboard box that their present came in more than the present itself? It's not so different with grown-ups -- a beautifully wrapped present can generate as many oohs and ahhs as the present itself. Bright wrapping paper, a cascade of curling ribbons, a luxurious bow, a teeny gift charm or an original gift tag -- all of those little extra special touches can go a long way towards showing your gift recipient that he or she is special to you. For me, personalization is key. 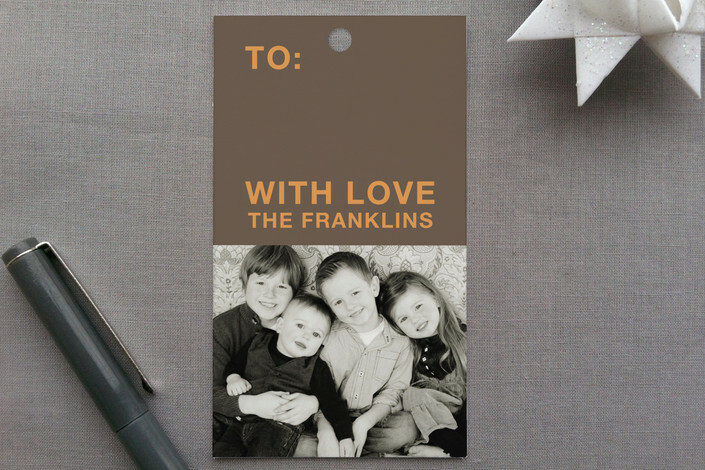 I love personalized gift tags as much as I love personalized holiday cards; not only are they ultra-convenient, they look so finished and classy-- as long as they're printed by the right company, of course. 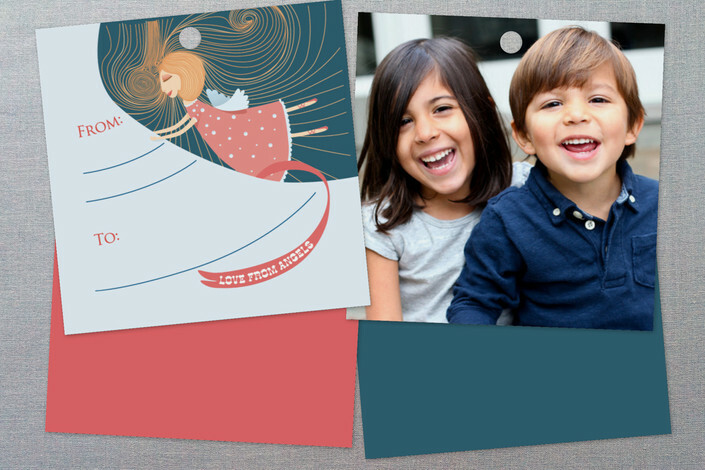 That's why I was so delighted to discover Minted 's collection of personalized holiday gift tags. They're hanging gift tags, with a hole on one end so you can thread a ribbon through and tie it to a gift bag handle or a ribbon on a boxed present. These are the first hanging gift tags I've seen from ANY stationery company! I've seen (and ordered) personalized sticker gift tags as well as personalized card gift tags (with envelopes), but these hanging gift tags are so much cuter. 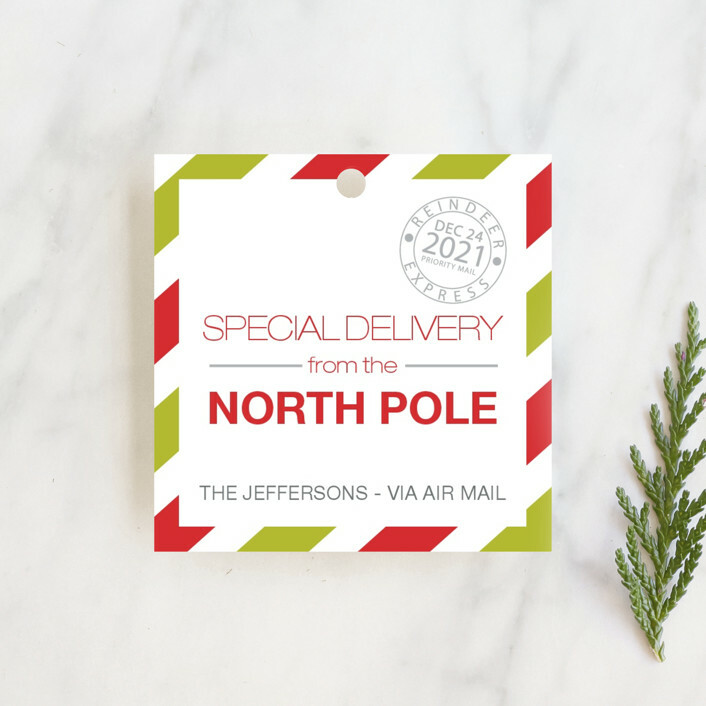 Minted invited me to personalize and order any of their stationery products, and since the holidays are just around the corner, I ordered gift tags in a variety of designs. Honestly, the hardest part was choosing a design. 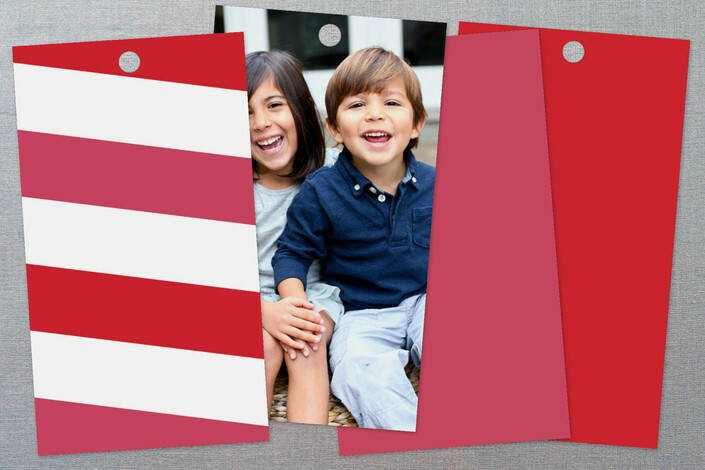 I blame Minted's community of thousands of designers; as with all of Minted's stationery products, the design options for the gift tags are unparalleled. They run the whole range of styles, from rustic to whimsical to funny to vintage to classic and more. The level of personalization is impressive. These gift tags really let your personality shine! All designs come in 2 or more color schemes. All designs let you add your name. Some designs let you alter some or all of the text: a holiday message, the year, etc... Some let you upload photos. Some are square. Some are rectangular. Hopefully they'll add circular tags soon. 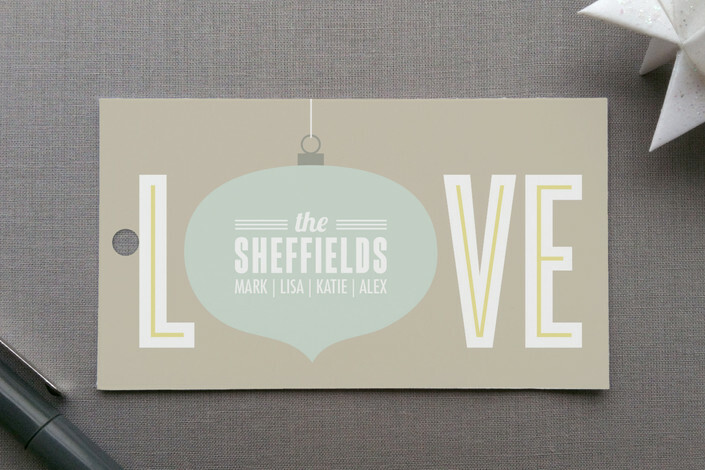 You can also choose from a variety of options for the back of the gift tag. You can opt for a patterned back (which varies by design), a solid color, plain white, or you can upload a photo or logo. It all adds up to a gift tag that's as special and unique as you are. My gift tags have just arrived, and I couldn't be more pleased. Everything from the paper to the printing is superb. Just 2 things I'm bummed about: first, ribbons are not included so you have to get your own, and second, practically all the gift tags are holiday themed. I need more non-holiday designs. -- do you know how many birthday parties my 3 kids attend each year? That's a LOT of presents to wrap and tag! Oh well -- at least I can rest easy knowing that I'll have the cutest gift cards and most eye-catching presents this holiday season. Disclosure: Minted supplied me with a gift card to review the holiday stationery product of my choosing. The views and opinions expressed here are my own. Our holiday break starts in exactly 2 weeks, and I'm starting to freak out about toy shopping. Once the kids are out of school there won't be any opportunity for me to shop for their presents, so it has to be done, like, YESTERDAY. I don't have the time to bother with guessing what it is they want, so I've asked them to give me a list of options that I can choose from. 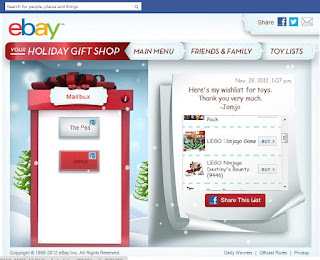 To help organize my holiday shopping, eBay invited me to check out their new Facebook app, the Holiday Gift Shop. Not only can my kids create their own toy lists, I can also create my own lists of everyone I'm buying presents for, with possible gifts for each of them. I asked each of my kids to create a Toy List, and they had a lot of fun browsing through the suggestions and dragging each item onto their list! Your child can choose from a variety of toys, categorized to make things easy to find (WARNING: For some reason only The Pea's toy list had the categories; any subsequent toy lists we created only listed All Toys, so it was really inconvenient to have to search through so many toys. I have not yet been able to figure out how to switch from an All Toys view to a Category view -- bear this in mind if you have more than one child!!). Once they find a toy they like, they simply drag it onto their toy list. 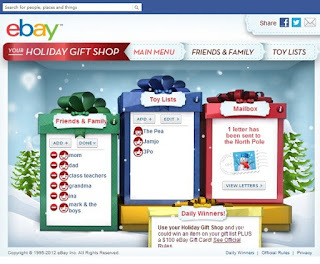 Once they click "Send to North Pole", it creates "Letter to Santa" that you can share with friends and family on Facebobok (you can edit which Facebook groups or friends receive the list, or you can specify individual recipients). They'll receive a shareable list with links to purchase the item on eBay. * one email is addressed to your child, from the North Pole, confirming the items on his wish list. * one email contains your child's wish list, with links to buy the items on eBay, that you can forward via email to family and friends (this is great if you don't want to do it through Facebook, or if grandma has an email address but not a Facebook account). 1) No one you create gift lists for can see what you've created. These are lists you are making for yourself. 2) You get great recommendations from eBay experts. 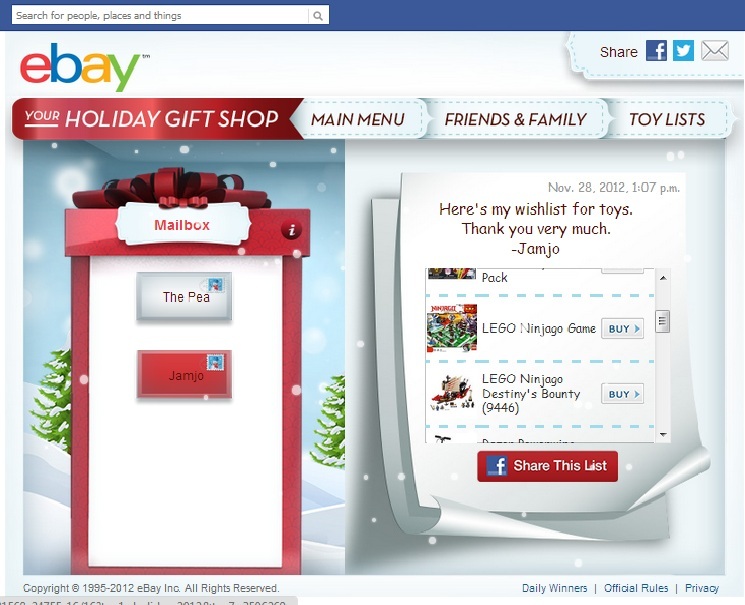 3) It's super convenient - It ties right into the eBay site and the eBay mobile app so you can shop anywhere, any time! The best reason to use this app: when you use it, you'll be entered into a holiday sweepstakes! Every day an item from someone's gift list will be given to them! Disclosure: This is a compensated post: I was hired by Splash Creative Media to write this post on behalf of eBay. App facts (in italics) are provided Splash Creative Media.. The views and opinions expressed here are my own. Winter is coming, and families who live in snowy areas know how important it is to prepare for months and months of snow. From weatherproofing the house to getting out the winter gear to preparing vehicles for winter weather, proper preparation will do wonders for your safety and comfort when the world freezes over. If it has been a while since our van's last checkup, I take it in for an oil change and service. I make sure we have our snow chains in the van with us. I make we have a squeegee and ice scraper, and I make sure our wipers are good, so that we'll be able to see clearly out of our windshield in the event of heavy snow or sleet. 1. Wash and wax your car at a professional car wash – It may seem counterintuitive to get your car nice and shiny for what’s often the sloppiest season, but a thorough wash can remove harmful compounds that may cause damage when mixed with sand and road salt. Experts from the International Carwash Association also recommend a coat of wax for an extra layer of protection from the elements. · Professional car washes can also save up to 20 percent of the amount of water you’d use by washing your car at home. They do this by treating and reusing their water, rather than releasing toxic chemicals and grime into the storm drains, which can often occur with pavement washing. Check out www.washwithwatersavers.com to see how professional car washes save water and help prevent pollution. 2. Check fluids – Check your coolant to make sure you have enough, as you’ll be left without heat if you don’t. Consult your owner’s manual to find the correct blend if you need to add more. It’s never a bad idea to keep extra coolant in your trunk in case of an emergency. Don’t forget about extra wiper fluid, either. It’s not expensive, so stock up! 3. Winter emergency kit – In addition to stocking your car with a scraper and brush, it’s a good idea to include a few provisions in case you get stranded in snowy and cold conditions. Pack extra blankets, hats and gloves, high-energy snacks like granola bars, drinking water and a first-aid kit. 4. Test your battery – The next time you have the car in for an oil change, ask the mechanic to test your battery to make sure it can provide enough starting power once the temperature plummets. 5. Check your wipers – When sloppy weather hits, you’ll want to make sure you have strong wiper blades to see through the elements. Checking your wiper blades for wear and replacing them if needed can prevent huge visibility headaches once snow and sleet arrive. It really pays to be prepared. Driving through a winter storm is scary enough, and if your vehicle isn't all set to weather the storm, it can get much, much scarier! Stay safe! Leave a comment on this post and share a tip for preparing your car or home for the winter. For extra entries, you can do any or all of the following (note the bonus entries for following me on Instagram!!). Please leave a separate comment for each extra entry with a way to verify the entry (i.e. tweet link, blog post link, Facebook id, Twitter id, etc.). 4) Pin this giveaway on your Pinterest board (1 entry -- you can use the "Pin It" button at the bottom of this page!). I entered the Winter Emergency Kit giveaway! This giveaway ends at 11:59PM PST on December 20, 2012; I will draw a winner at random on December 21 and post their name after they confirm acceptance. Continental US residents only. For additional giveaway rules, click here. Disclosure: The International Carwash Association provided the giveaway prize pack as well as a second prize pack for me. Winter tips (in italics) were provided by the International Carwash Association via Blue Chip Communications. ICA, through its Wash With WaterSavers consumer awareness campaign, is committed to promoting the importance of using eco-friendly carwashes that use less fresh water and return clean water back into the environment.The views and opinions expressed here are my own. We watched Disney's Wreck It Ralph over Thanksgiving weekend, and even though I don't really play video games (I leave that to my kids! ), I thought the movie was excellent. The kids enjoyed seeing their favorite video game characters on screen and left the theatre wishing there were really a Sugar Rush game. Good news for the kids: Disney Publishing's Wreck It Ralph Storybook Deluxe actually does have the Sugar Rush racing game! You can build your own candy racing kart by selecting a base model, adding wheels and a tail spoiler, then decorating it with icing and sprinkles. If you choose to save your candy kart creation (BTW once you save the kart I have no idea how to delete it), it becomes a selection option for the Sugar Rush game. You can also choose to drive the candy karts of Vanellope, Taffyta, Rancis, Candlehead or Adorableeze. Then choose from a variety of race tracks (Easy, Medium, Difficult) and you're off to the races! Here I am in Sugar Rush, racing against Vanellope, Taffyta and the rest of the gang in the kart I created. You tilt the iPad from side to side to guide your kart through obstacles and around bends, tilt it forward to speed up. You also receive speed boosts when you collect candies. You can also monitor your position in the race via the little TV icon on the top right of the screen. Kids who are used to Mario Kart and other sophisticated racing games will find this a bit simple, but just being able to race in Sugar Rush is actually going to be a big rush for your kids after they've seen the movie! Of course, that's not all you can do in this app: it's also a storybook, so you and your child can relive all the fun of the Wreck It Ralph Story. You can have a narrator read the story out loud, record your own voice reading the story, or turn off narration and have your child read it on his or her own. The book using voice clips using the original voice actors from the movie (Sarah Silverman, John C. Reilly, etc..) and visuals are stunning, just as good as the movie -- in fact, the book plays short clips of scenes from the movie as you tap the screen to get the story moving along. Here's a fun tip: watch out for Vanellope's head hovering around the edges of your iPad. If you tap on Vanellope's head, she'll pop up on your screen and say something! This app doesn't have drawing features or mini puzzle games like most of the other Disney Deluxe Storybooks, but the Sugar Rush game makes up for that. There is a free Fix It Felix app and a premium version for 99 cents, but neither have the Sugar Rush racing game (the 99-cent app has a Sugar Rush game but it's a race to climb peppermint trees). I love this app and highly recommend it for Wreck It Ralph fans. Disclosure: I received a free download of Wreck It Ralph Storybook Deluxe o facilitate my review, but have not been paid to review the product or give my opinions. The views and opinions expressed here are my own. When I was a child I loved watching the Batman TV series starring Adam West, but until recently I've been reluctant to let my kids watch the Batman movies, because they are so dark and gory. The Batman TV series and cartoons of yesterday were so much more wholesome, so much more campy, almost comic (remember the BAM!! WHAM!! KA-POW!!! onscreen graphics?!). 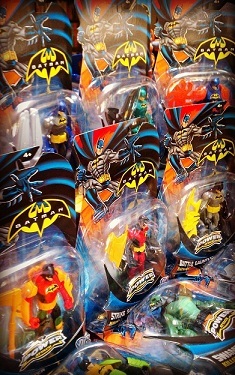 That's why it's so nice to see the new Batman Power Attack line of Batman action figures geared for younger kids. They're not just collectible items, they're meant to be played with. 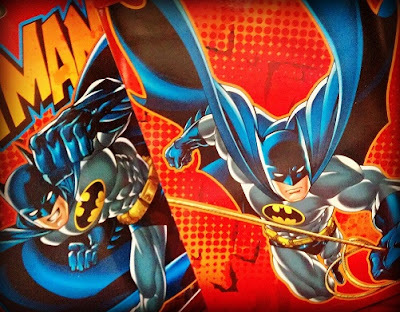 The Batman Power Attack figures are sturdy (but not chunky, so 8-year-olds know they're obviously not meant for 4-year-olds), with exaggerated features and brighter colors. True to their name, each action figure is poseable and comes with weapons so kids can give free reign to their imagination. The deluxe figures also feature more sophisticated weapons and motions, like karate kicks or flip-open chain saws. 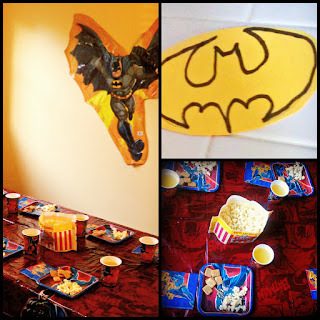 Last week I hosted a Batman Power Pack party for 3Po, Jammy and 8 of their friends. MomSelect Parties generously provided everything we needed: Batman plates, cups, napkins, tablecloths, balloons, goody bags and Batman Power Attack toys galore! All the boys were so excited when they saw everything. 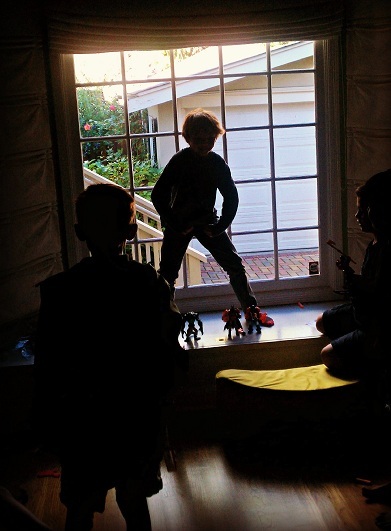 Each one quickly chose an action figure and began playing. I doubt whether any of these boys have watched the Adam West Batman series, but I could hear lots of BAMs, WHAMs and KA-POWs all afternoon. 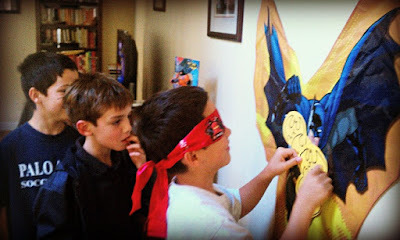 We played Pin the Bat-Signal on Batman in order to see who would win the deluxe Batman Power Attack action figures and Batmobile. 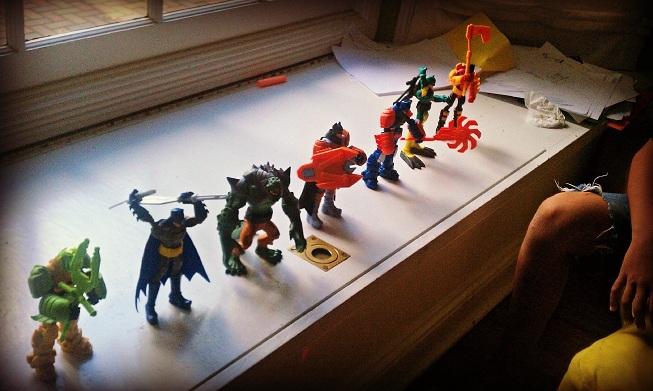 The boys lined up all the figures up to admire them and debate which figure had the most awesome powers or weapons. 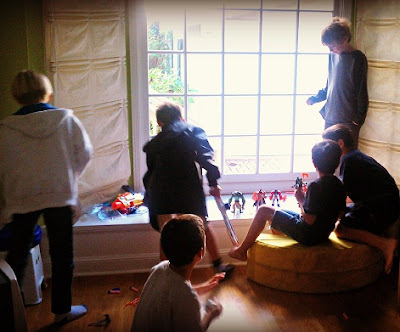 That line of action figures quickly became a target range as the boys brought out the Nerf blasters and had an arcade style game of Knock Over Batman. Oh well, boys will be boys. The targets quickly evolved from the plastic kind to the human kind, but I put a stop to that, so they contented themselves with posing in front of the window and seeing who could come up with the most superhero-like pose. 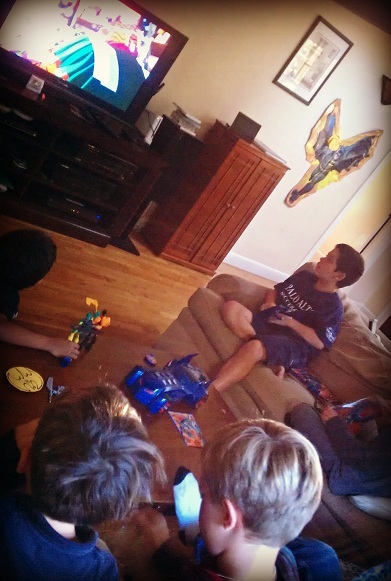 The party pack also had a DVD of Batman The Brave and The Bold cartoon series, so the boys grabbed their toys and settled down to watch a couple of episodes. My young superheroes need to power up between activities, so I set up a snack table where they could refuel on popcorn, juice and graham crackers. 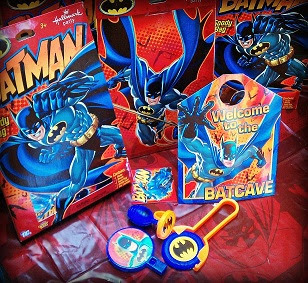 At the end of the day each boy got to take home a Batman goody bag along with his new Batman Power Attack figure, featuring fun trinkets like a sticker, whistle, door hanger, squirt gun and disc launcher (the squirt gun and disc launcher were big hits!). The party was a smashing success! 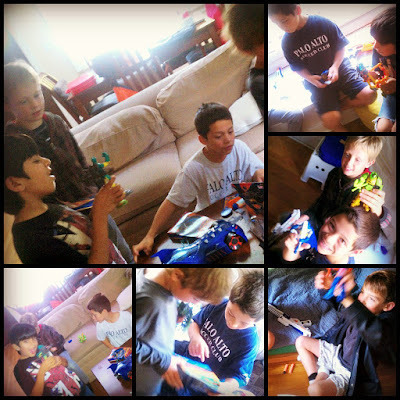 All the boys had a blast -- a high powered blast, to be exact. Two hours passed by in the blink of an eye; even better, there were no hurt feelings, tears, broken furniture, whines of boredom or headaches for mom! Our party proved it: forget bouncy houses and magicians or ponies. 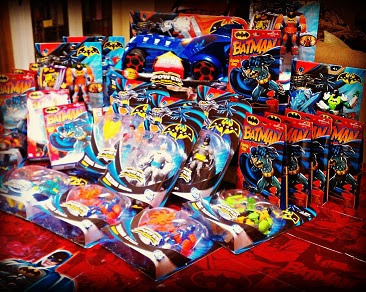 The only thing you need to host a successful party for 5-8 year old boys is a bunch of Batman Power Attack action figures and a Batman DVD! Disclosure: I received product samples, party decor, and party favors via MomSelect Parties in to facilitate my review, but have not been paid to review the product or give my opinions. The views and opinions expressed here are my own. My husband is the first -- and so far, the only -- member of his family to have a college degree. Growing up, no one in his neighborhood had one. He drove trucks and fixed combine harvesters for a few years before realizing the only way out of his working class roots would be for him to get a college degree. Getting that college degree has literally changed his life. Without it, he probably would have been been a bricklayer or a carpenter or a builder. Instead, he got a degree in computer science, joined IBM, and never looked back. He gained financial freedom -- he was able to buy a house, buy his parents a car, take them on trips. He makes good money doing something he loves to do. Plus, without a college education, he would have stayed in his hometown forever and never have met me! I, on the other hand, had the good fortune to be born into a family that not only recognized the importance of a college degree, but also had the financial resources to pay for it. With our combined experiences, there's no question that our children will be pursuing higher education after they graduate high school. They just assume that after high school, they will go to college. increased from $8,256 in 2011‑12 to $8,655 in 2012‑13. * For out-of-state students at public four-year institutions, average tuition and fees increased from $12,567 in 2011-12 to $13,051 in 2012-13. * Average published tuition and fees at private nonprofit four-year institutions increased from $27,883 in 2011-12 to $29,056 in 2012-13. * Scholarshare is a 529 college savings plan, so the funds in your account grow tax-deferred, and when funds are taken out for qualified educational expenses, they do not incur any federal tax. * You retain control of your account. Currently I have 3 beneficiaries in my account -- each of my 3 kids -- so if 3Po becomes an international soccer star at age 17 (one of the few reasons we'd be comfortable with for deferring college! ), I can transfer the funds in his account to The Pea or Jammy. * You can have your contributions deducted directly from your paycheck or checking account. The minimum automatic deduction is just $25 per month. You don't have to remember to do anything, you'll hardly even miss $25 per month, and it all goes directly into your child's college account. * There are a ton of investment portfolios to choose from, including age-based funds, fixed income funds, international funds or a mix. What's more, their plan fees are super low. Over the years, we've had a good experience with Scholarshare. We basically set up our accounts, then forgot about it. Over the years Scholarshare has changed their fund manager several times -- from TIAA- CREF to Fidelity then back to TIAA-CREF -- but the transition was seamless as far as we were concerned. No need to re-register, no need to transfer funds to and fro. The only thing that changed was the the logo on our statements. It's a good feeling knowing that we're putting a little bit aside every month for our kids' education. Last week Scholarshare invited me to dinner so they could share all the benefits of their 529 plan with me and other Bay Area bloggers. It was great to be able to speak with the Scholarshare people, find out what's new with Scholarshare, share my Scholarshare experiences with the other bloggers, and talk about the challenges of saving for college. I discovered that Scholarshare now has a college savings app that helps parents enter how much they want to contribute each month, then figure out how much money they will end up with when their child enters college. I downloaded the app during the dinner and was shocked to see how much more we need to save! I knew what we are currently putting away wouldn't be enough, but it will barely be enough to pay for beer consumption! I'm happy we've been proactive about saving for college with our Scholarshare account, but clearly we need to do more. After all, there's nothing better we can do to invest in our children's future than a college education, and there's no better way to do it than with Scholarshare. Find out more about Scholarshare on their website or Facebook page. Disclosure: I was invited to a Scholarshare Dinner and received a gift card for this post.. The views and opinions expressed here are my own. Instagram Profiles are now on the Web! Check out the Whole Foods Body store!